Two great references I would recommend utilizing as you plan your trip the Big Island. Hawaii Revealed: This started out as a book and has turned into an app and a website with the most comprehensive guide to all things Big Island (they also have the same resources for each of the other isles as well) Check our their site by clicking HERE. The Facebook page 365 Things To Do In Kona, HI is run by a woman who moved to Kona a few years ago and is always checking out great places on the island and sharing her experiences. Great for keeping abreast of the latest and greatest. Mauna Lani – Fairmont Orchid and Mauna Lani Hotel (closed for complete renovation till end of ’19) are both great choices with beautiful beaches (Fairmont Orchid has THE best beach for little kids, quiet and protected, but gorgeous) VRBO condos are plentiful; has a great shopping center in the middle of the ‘neighborhood’ with a Foodland, coffee shop, Tommy Bahama restaurant/store, Ruth’s Chris, smoothie shop, and many others. Free hula shows on certain nights in the square. Some VRBOs have access to the Mauna Lani Beach Club which is fabulous!!! Mauna Lani Beach Club is awesome with a great restaurant too! 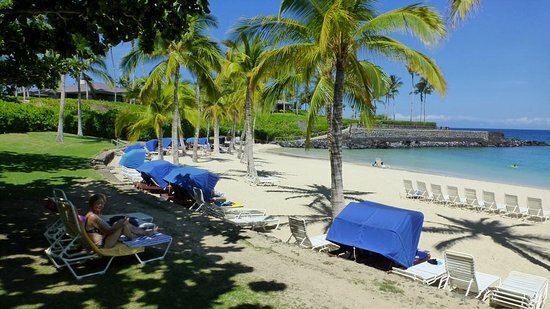 Waikaloa – If you want BIG resort experience, the Hilton Waikaloa is great but no real beach you can walk on to FYI. But it has just about everything else, including Dolphin Quest. VRBO options we recommend – Hali’i Kai condo is one of our favorites. Waikaloa has 2 malls, a huge grocery store, lots of restaurants, and a gas station. A bit more crowded than Mauna Lani. Mauna Kea — a little further north along the shore so a bit further from some activities we prefer but might have the best views on the island. Mauna Kea hotel is older, but beautiful and classic; (FYI on my recent trip in Jan ’19 it was being renovated.) next to one of the best beaches in the world. VRBO options have amazing views and most owners provide beach access for a small fee to renters. Hualalai – closer to Kona, which is nice; Four Season Resort is fabulous but obviously much more expensive, as are VRBO options in this area. No real shopping area here but super convenient to airport and shops in Kona. The Beach at Four Season Hualai can’t be beat! They have the best sunsets here! 5. Puako – small community of VRBO options that are either direct ocean front or across the street. Choose carefully as some options are better than others. Recommended for vacationers that really want to ‘get away’ as it is a bit farther off the main highway so not as convenient as the other resort areas. No grocery or amenities either. Kona – close to the airport; lots more shopping and restaurants, plus a Costco and a Target. I am not familiar with the hotels in the area but I have heard the Sheraton is nice. It is also where one of the Manta Ray dives occur (which I HIGHLY recommend if you are the adventurous type) I would recommend using VRBO if you want to stay in Kona. Lots of options here with beautiful western facing views of the ocean. Might find some less expensive VRBO options here. Merriman’s in Waimea – amazing and always good service. Always fresh and locally sourced. One of our faves on the island. Bring a jacket to Waimea. It is up along the Kohala Mountain and is usually 10-15 degrees cooler than Kohala. $$$ Get reservations. Brown’s Beach House at the Fairmont Orchid (where we ate our Vow Renewal dinner last year) awesome seafood at an all outside restaurant next to the beach $$$$ Reservations recommended. This was our view while we ate Dan’s 16th Birthday dinner at Ulu! Roy’s in Waikaloa – it’s a chain but it’s still really good. Great Hawaiian food. Our crew at The Fish and The Hog on our last day! The following restaurants I have not been to but have been recommended by a few locals who know the area. Seafood Bar and Grill in Kawaihae– have not eaten here yet because it is new and was closed when we tried but have heard great things about this place! Snorkel/Whale Watch/Swim with Dolphins Tour – lots of options here but our favorite with is Adventure X. They do a great job and they dock on the Kohala Coast )close to the resorts) and not in Kona like almost all the others so super easy and fast to get to them. Pololu Valley Lookout – past Hawi town (worth a stop and a stroll, at least for the ice cream) it is about a 20 minute hike down to the gorgeous black sand beach and then you can also hike in/around the valley as well. Breathtaking and one of our absolute faves. Could even take a picnic down there. (but I would not recommend swimming in the beach — way too strong.) Drive home on Kohala Mountain Road – the views are incredible! Drive to Hilo via Hamakua Coast – visit Waimea town (they have 3 farmers markets on Sat mornings) then keep heading east to check out the East Coast and the gorgeous scenery. Stop at Lapahoehoe State Park, Akaka Falls, What’s Shakin’ for a smoothie and then on into Hilo. Mauna Kea Visitor’s Center – can visit or book a tour at the summit on most nights. But at least check out the visitor’s center. It looks and feels like you are on Mars. Manta Ray Snorkel at the Mauna Kea with Manta Ray Advocates. This was one the greatest experiences I have ever had. See the manta rays up close in the wild at night. NOT for the faint of heart but SO WORTH IT!! You can read about our experience here. Hawaii Volcano National Park We haven’t been in a few years but this must be done at least once! It is so incredibly fascinating to see how these volcanoes have been changing the shape of the islands and how they continue to grow new land. Helicopter Tour — Not everyone is going to be up for this, but if you can muster up the courage (trust me, I felt safe the ENTIRE time!) it is SO WORTH IT!!!! You can do a full tour of the island with Blue Hawaiian Helicopter Tours 5 minutes from the Resorts or ride from Hilo with Paradise Helicopters for an even more exhilarating experience. Both are amazing!!! Best way to see all the different parts of the island, the recent eruption (lava if it starts to flow again), etc. You can read about our ‘Doors Off Experience’ here. Kealekekua Bay (otherwise known as Captain Cook Bay/Monument) — some of the most unbelievable snorkeling you can imagine. Just gorgeous. Take a boat tour here or just rent some kayaks and paddle over to the monument to snorkel the amazing reef that looks just like the one in Finding Nemo! Dolphins come here almost every morning so you may make some friends along the way. Head back uphill to the Coffee Shack for a snack or lunch after your snorkel. Amazing views! Mike took this on our last visit at Kealekekua Bay. Hapuna Beach State Park– rated one of the most beautiful beaches in the world. Ample parking too. Kua Bay – another fabulous beach closer to Kona. Worth the drive. If you want to see a BRAND NEW BLACK SAND BEACH, Poihiki State Park might be worth the drive if you are staying in or near the East side of the island at all. The sand appeared almost overnight July, 2018 during the Kilauea eruption, almost completely covering up the boat ramp (making it inoperable) but the surfing here is supposed to be amazing and the view looks gorgeous too. Not often you get a chance to step on brand new land that literally did not exist a year ago! Pic by Ikaika Marzo of Poihiki Beach, probably before the lava had even had time to cool. Now there are lifeguard stands, surfers and sunbathers and the green foliage has all come back. If you find this helpful and end up visiting this glorious place, drop a comment and let me know what your thoughts! Would love to hear them!